Standing by the sea – today it’s green and angry, the wind strong and the sky threatening – the scene looks very similar to the last time I was here in Muisne, some twenty years ago. A large number of tide born logs covers the long and hard beach where, says Hipólito, the owner of the hostel where I’m staying, even light aircraft can land, adding after a second, that of course these belong to the government. Walking towards the town, the environment is still as I remember it. Solitary birds sing sporadically wrapped in the heat of midday and an almost medieval silence, there are virtually no cars here and their absence makes this island of Muisne something very special. What is different is that these days the beach is full of plastic, of all colors and sizes, although I don’t suppose that is really so different, it’s happening to almost every beach in the world. A recent report tells us that on an uninhabited Pacific island more than 17 tons of plastic were collected. People don’t bother, says Hipólito, they leave the bottles, the bags and what have you, the sea carries it all away and then brings it back again. Unlike the new esplanade that forms part of the bridge built and just opened by the central government, there’s no-one here to clean up after the people have gone. But while plastic may be a problem for tourism, one of the important sources for the island before the April 2016 earthquake, it is by no means the only one facing the people who live here. 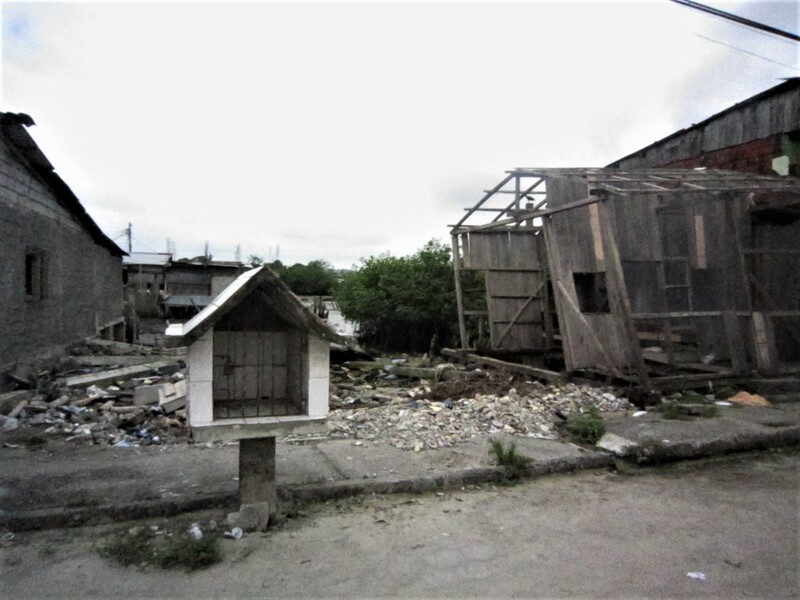 More worrying than plastic, although less visible, is that the people of this island in the South of the Province of Esmeraldas, Ecuador, are under threat of eviction. The 2016 earthquake left many homeless and changed the life of the island. Families abandoned their land to go and stay with relatives or were housed in the government provided lodge on the other side of the river, a few kilometers away, on high ground. 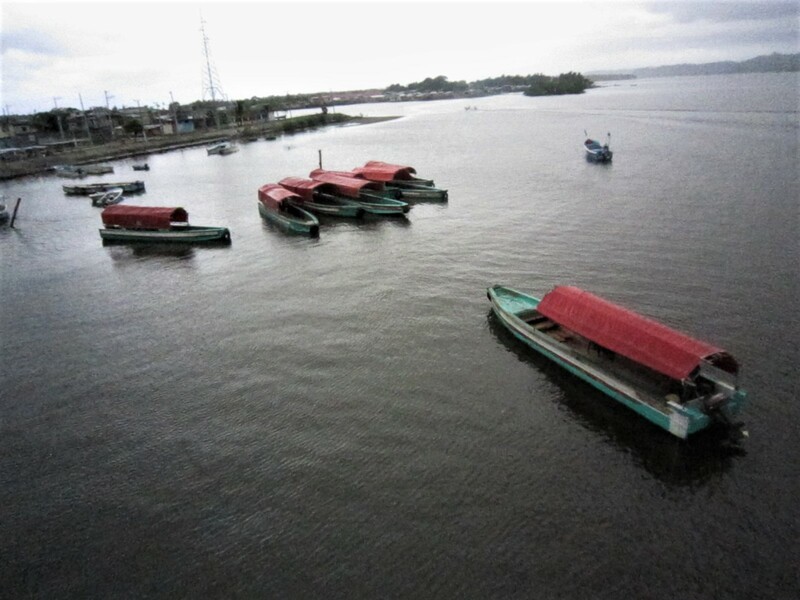 After the tragedy now ex-President Correa declared the island unfit for habitation due to the threat of a Tsunami or flooding due to high tides. People had to go to the ‘mainland’, he said, the island should be reserved for tourism, and what was more the state would not help build any new homes or repair those affected by the quake. All state services were to be withdrawn. He says that immediately after the earthquake 90% of the population left the island, but little by little they returned; they hadn’t lost their homes and while there was damage, it could be repaired. “The Island is their home,” Frank says firmly, angry, thumping his fist on the table, “that’s where they’ve built their lives, their businesses.” Outside on the main street, a banner hanging from the second floor of his office-hostel challengingly states: “Here we stay.” It’s a challenge as much as a statement. The earthquake isn’t the only thing that‘s changed in Muisne. The new bridge over the narrow river separating the island from the mainland is pedestrian, an evacuation measure for the population in case of emergency. Sitting nearby on the newly paved embankment, some of the neighbors tell me that the bridge is no help to tourism, what‘s needed, they say, is something wider that will allow vehicles to cross. But there are actually more vehicles now than before. These are the mototaxis that carry people over to the ‘continental’ side, as they call it, where they can do their shopping; one shop owner I talk to tells me there’s more trade than before. Besides, he says, the prices on this side are lower. Why this should be is not entirely clear, but I suppose he must know. They talk about people like Pierina Correa, the ex-President’s sister, or his brother Fabricio, while others mention ‘the Chinese’ who, they say, came to explore here before the earthquake. There’s titanium in the black sand they’ve been mining at Mompiche, one man tells me, wondering if that’s what they were looking for. People admit that there’s no evidence or documents they can show me, although they do mention similar cases such as Port Engabao in the Province of St. Helena, where people are fighting not to be evicted from communal lands, to not have developers take over and build resorts that will leave them out in the heat, with no land and no work. He does recognizes that staying was not an option for everyone; some lost everything and were forced to leave. 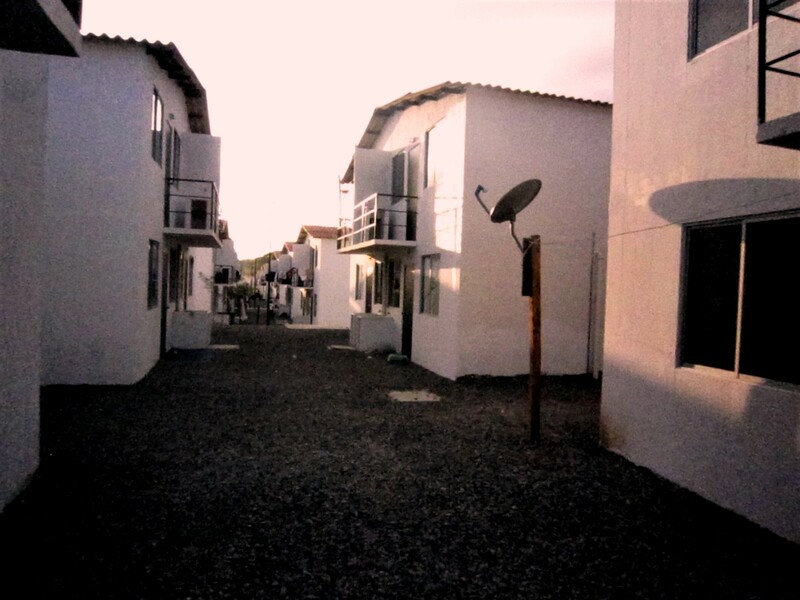 A good number ended up living in the shelter operated by the Ministry of Economic and Social Inclusion, MIES, obliged to stay for more than a year in order to receive state support in the form of an apartment. 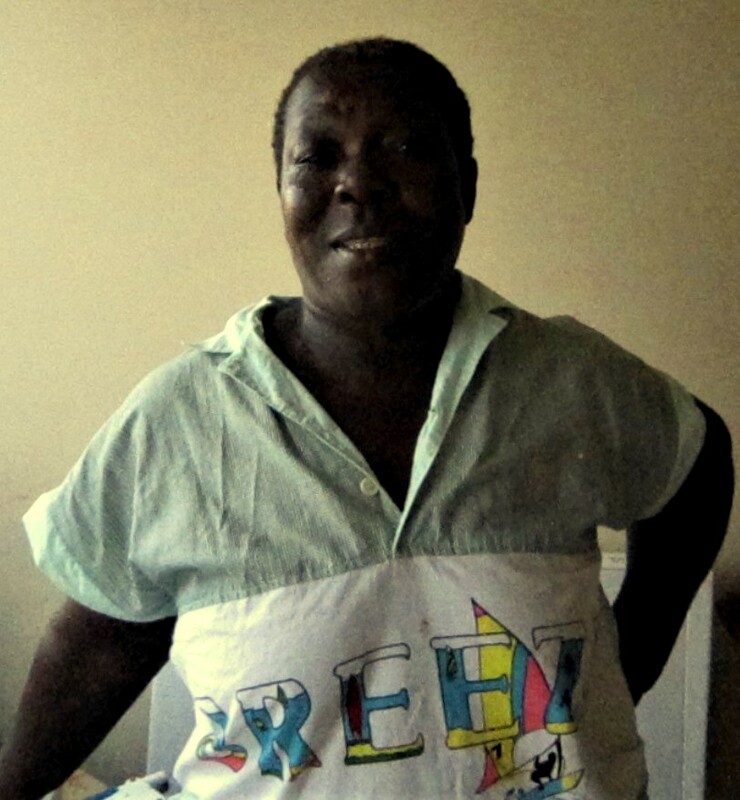 One such person is Fanny Mina, a woman well-known on and off the Island for her long fight on behalf of the women shellfish pickers in the area. “These women” she recounts “were affected the shrimp farmers arrived over twenty years ago and destroyed much of the mangroves we depended on.” Irony then, that now, talking outside the ‘house’ the government handed over to her a few days ago, we can see a shrimp farm, situated just on the other side of the road. The problem is real and not just for her. For people who can’t work, have no money and no pension, life will not be easy even with a new apartment. How is she going to pay? I ask myself, and then her. “God will provide,” she says with an unconvincing smile. “How are you going to furnish the house? How what are you going to pay the mortgage? Each case is different, no doubt for some with families able to support them, the process will be relatively easy, but for others without family resources the story will be different. Forging a new existence away from the surroundings of a lifetime is no small thing, even with a new apartment. It’s not that life in Muisne was ever easy. “This has been forgotten territory,” says Father Anan, “but the earthquake has put the island in the spotlight both nationally and internationally. Most people have decided to stay, we are united, and I truly believe that the people who continue to struggle in their daily lives will receive God’s blessing.” The priest speaks with surprising solidity, he’s young but quite clear about how important the island is for his parishioners. What is not clear, on the other hand, is exactly what Rafael Correa was thinking when he signed Presidential Decree 1215. Did he imagine that it would be possible to remove an entire town of ten thousand inhabitants, families that have lived for a century or more on the island? Did he have in mind building a new city, clean and shiny but far from the sea, far from the work, far from the previous life of its population? Who, he imagined, would be in charge of building the necessary houses and facilities in times of austerity? We don’t really know what he was thinking. But what we do know is that the Decree he signed now looks more like a visceral reaction than a considered decision, based on solid arguments and criteria. Or perhaps, as they say, there really are interests in play and that’s why the solidity of the criteria isn’t really important, they simply serve as a way to facilitate the eviction, nothing more. There is risk, it makes no sense to ignore it. The island is only 4 meters above sea level, but without technical fundamentals it is impossible to estimate that risk and decide on what measures to take. To attempt to expel an entire town without dialogue and without listening to the inhabitants is simply irrational. The population, meanwhile, voted with its feet, returned and wants to stay, knows its reality and has raised its voice. Would not it be logical to help them improve their lives, rather than against them?, asks Father Anan, “The government has to listen to the people, it has to listen to the popular will.” Amen.